The Germans are the masters of long words and long sentences with the verb at the end (frustrating simultaneous translators the world over). German datasheets are 30% longer, or in a font size so small they are hard to read. But, Germans are capable of short stories as well. 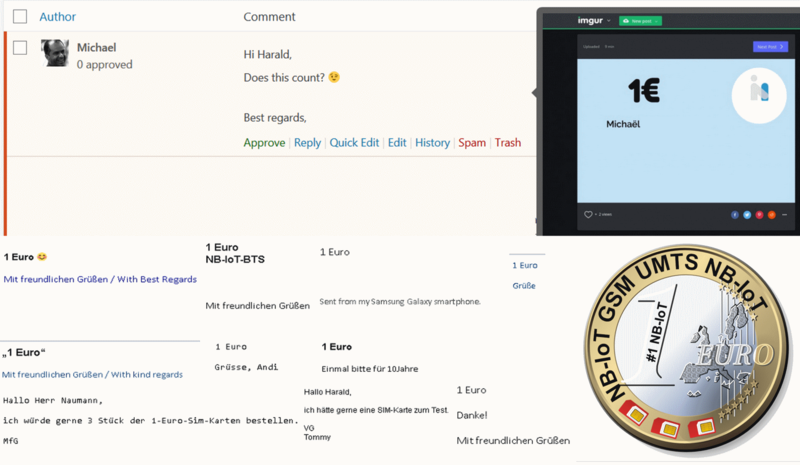 To cut a long story short, I told my customers to send the message “1 Euro” to get listed as a Beta tester for the 1 Euro per year SIM card. This is a German SIM card offered with European roaming. It costs 1 Euro per year, with a 50 MB per year data allowance which works out at 4 MB per month and 8 Cents per month – you sign for 10 years and get a 10-year subscription for just 10 Euro. It is the shortest and simplest LPWAN story I ever have seen and covers NB-IoT, GSM, and UMTS for now. Further news to follow. I will keep you posted. Has this short story piqued your interest? Do you like the idea of the 1 Euro per year SIM card? Would you like to test it? Are you planning your own inexpensive LPWAN IoT device? Do you plan to deploy IoT devices with embedded antennas? Do you have an IoT prototype and need to optimise the design or minimise the price? Do you have an IoT prototype and need to shrink it? If you have answered YES to any one of these questions then please do not hesitate to drop an email to harald.naumann (at) lte-modem.com and to ask for a proposal or some engineering services to make your IoT idea a cost-effective reality. Hi Robert, you will find an email in your inbox.